Remember a couple years ago I captured video about Leo Laporte looking at the OWLE for the first time? That was CES 2010, and we were on the 3GS. Two years later we have a more powerful iPhone, so why not a more camera attachment to make the device even better than what it is? That is where the OWLE Bubo comes in. The OWLE Bubo is just a container. However, with this container, you can put on more attachments than imaginable. From lenses to shoes for lights and microphones. Put it on a tripod, or even a steadi-cam for optimal video performance. Make that 8 MP camera really shine! 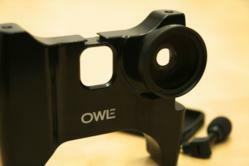 OWLE Bubo comes with a full size lens and a microphone attachment. Get a little creative and you can put a wireless microphone and full pro lens kit on it. I have seen it happen already. Get OWLE Bubo for around $160. Then let’s see the camera buffs and moviemakers in you come out.